A Summer deal you can't ignore! A Summer deal you can&apos;t ignore! WHO: Opened in August 2007 as Tampa’s newest luxury hotel, the InterContinental Tampa is centrally located in the heart of the city, within walking distance to several popular shopping and dining destinations, and convenient to family-friendly attractions, including the Florida Aquarium, Lowry Park Zoo and Busch Gardens. WHAT: Weekend nights at the InterContinental Tampa are BOGO (Buy One, Get One Free) this summer. Guests purchasing one weekend night Thursday through Sunday at prevailing retail rates receive the second night or a second room on the same night for free. Beginning at just $159*, the package also includes a disposable camera and a 5x7 picture frame so guests can document their fabulous summer escape to Tampa. WHY: InterContinental Tampa is the ultimate weekend escape for couples and families, with a rooftop pool offering spectacular views of the bay and city; a state-of-the-art fitness center; and outstanding on-site dining at the world-famous Shula’s Steak House. Guests can also enjoy gourmet Illy coffee products and “fare on the go” at Caffé, and an extensive cocktail menu at Shula’s No Name Lounge. I could talk forever about the hotel, but visit www.intercontampa.com to read all about it! 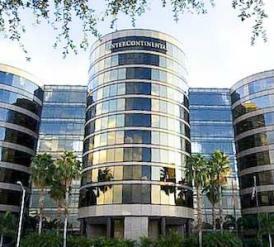 HOW: To reserve the weekend Summer BOGO package at InterContinental Tampa, please call (866) 402-0758 and mention rate code ILE3P or visit www.intercontampa.com. And there you have it...a deal that you can&apos;t refuse at one of Tampa&apos;s coolest hotels! So, get on there, book your trip and come take advantage of this amazing value! And keep checking back for more updates about great things to do in Tampa Bay! Until next time...get booking!